Maratha rule in Thanjavur was established in 1676 A.D by King Venkoji alias Ekoji. During his rule in 1677 A.D, Samartha Ramdas Swami who was the spiritual guru of Chatrapathi Shivaji the great came to south for Rameshwaram yatra. He visited Mannargudi first. King Venkoji after knowing about Ramdas swami’s visit to Mannargudi, he went to Mannargudi to invite Samartha Ramdas Swami to Thanjavur. Samartha Ramdas accepted to visit Thanjavur. 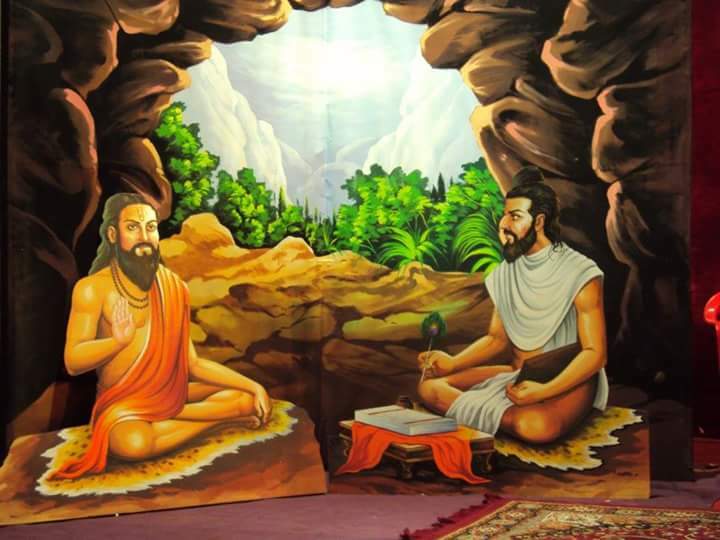 Swami Samartha Ramdas spiritual adviser of Chatrapathi Shivaji the great has visited Thanjavur twice during the period of King Venkoji alias Ekoji and blessed him. 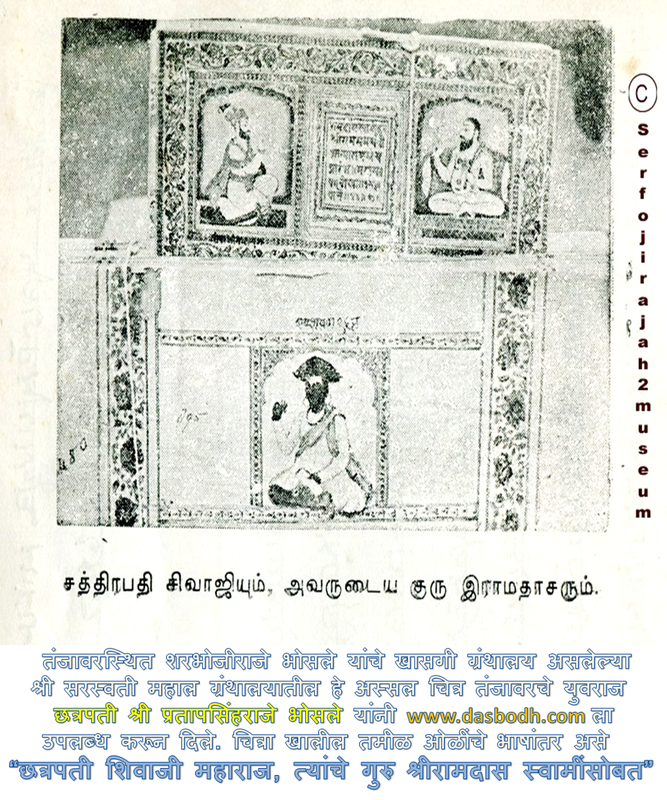 Portrait of Samartha Ramdas Swami at Serfoji Memorial hall museum,Sadar Mahal Palace Thanjavur. 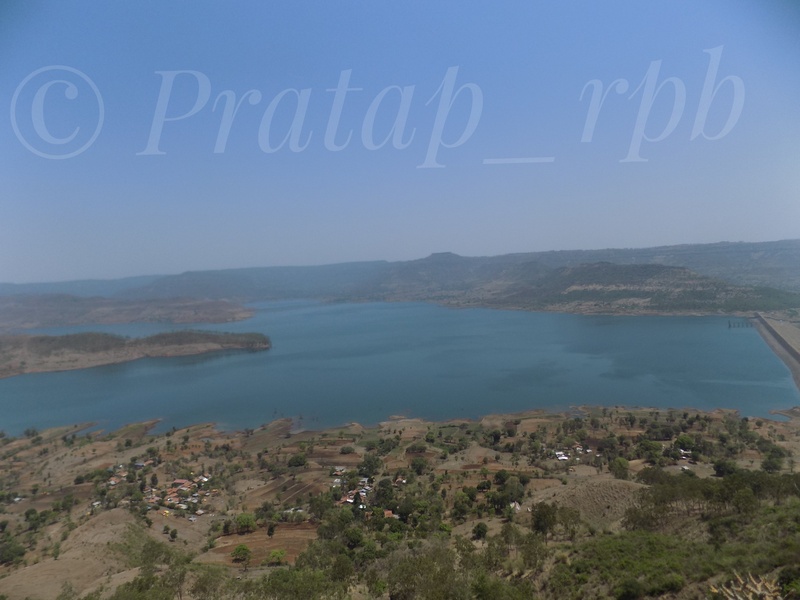 Photo Courtesy: Pratap_rpb. 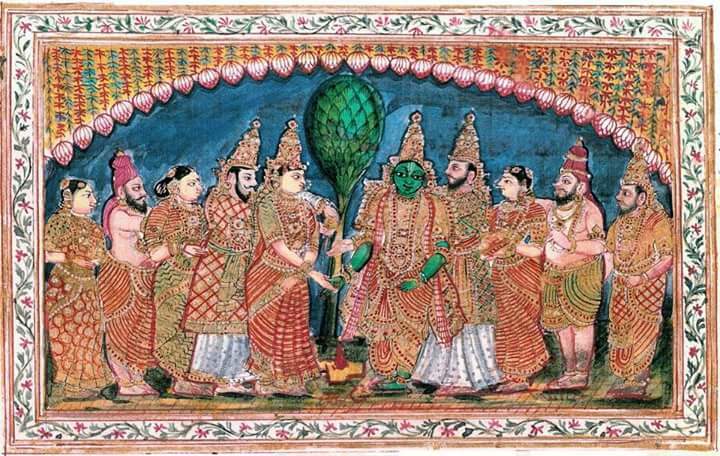 In 1677, Samartha visited Thanjavur, and left behind his disciples, who went on to establish mutts in Thanjavur. 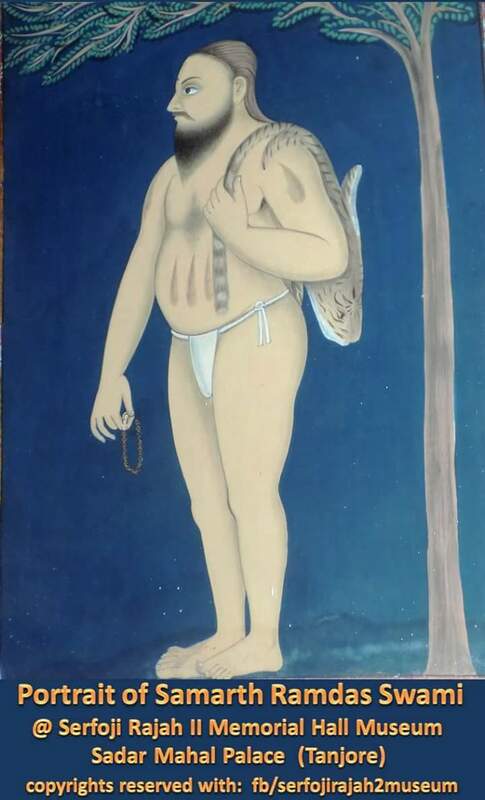 The earliest of these is called locally Peria (big) mutt, and Anantha Muni established a mutt in Mannargudi and Raghava Swami established one at Konur. In Thanjavur, King Venkoji made him to stay at Samandan kulam where the first Samartha Sampardhaya mutt was installed by Samartha Ramdas. It is also known as Bheemaraja Goswami Mutt (Big mutt). 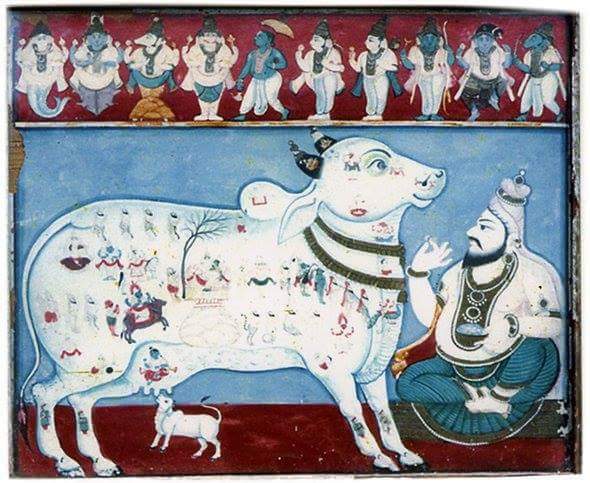 Samartha’s disciple Bheemaswami Shahapurkar was the incharge of that mutt. He lived 66 years in that mutt and Samartha sampardhaya was developed. In his year of 99 he took Samadhi. Worshipping at Sajjangad Ram temple where bronze idols of Rama, Sita, lakshmana and hanuman are installed which were made in Thanjavur and taken to Sajjangad by Samartha Ramdas Swami for Worshipping. While Samartha gave Thanjavur the art of Harikatha, from which came the art of Harikatha Kalakshepa, Thanjavur showed its gratitude to the saint, in a different way. 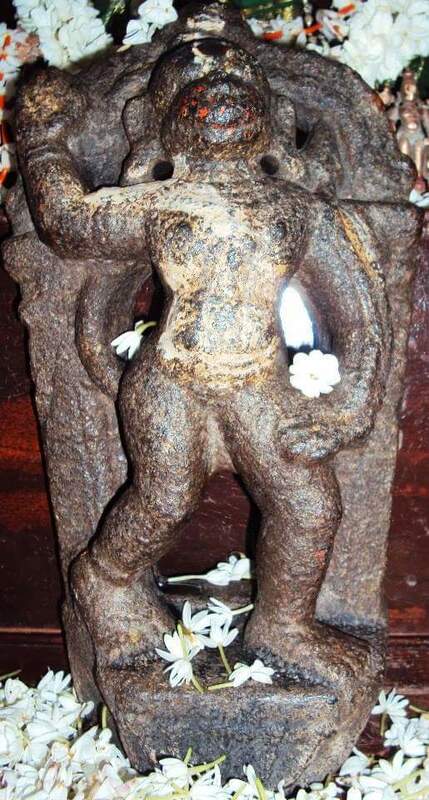 Samartha is said to have restored the eyesight of a blind Viswakarma of Thanjavur and requested the latter to make bronze idols of Rama, Sita, Lakshmana and Anjaneya. 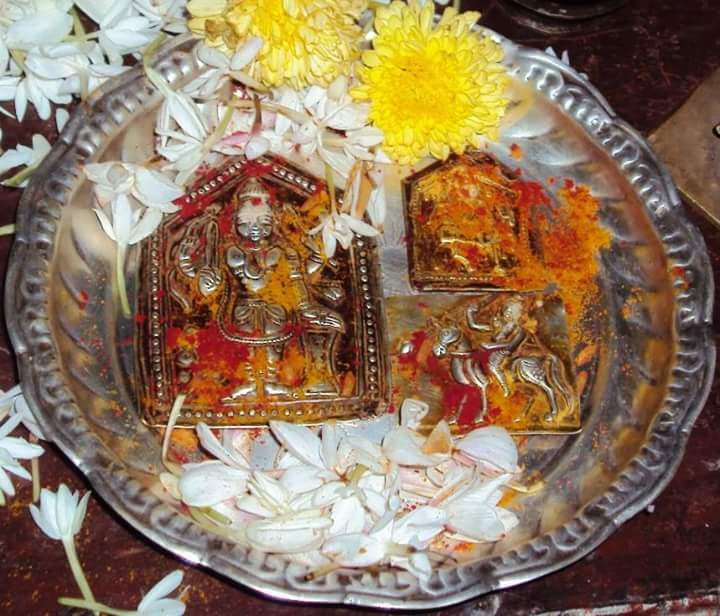 Samartha took the idols with him and worshipped them in Sajjanagad, where he attained Samadhi. 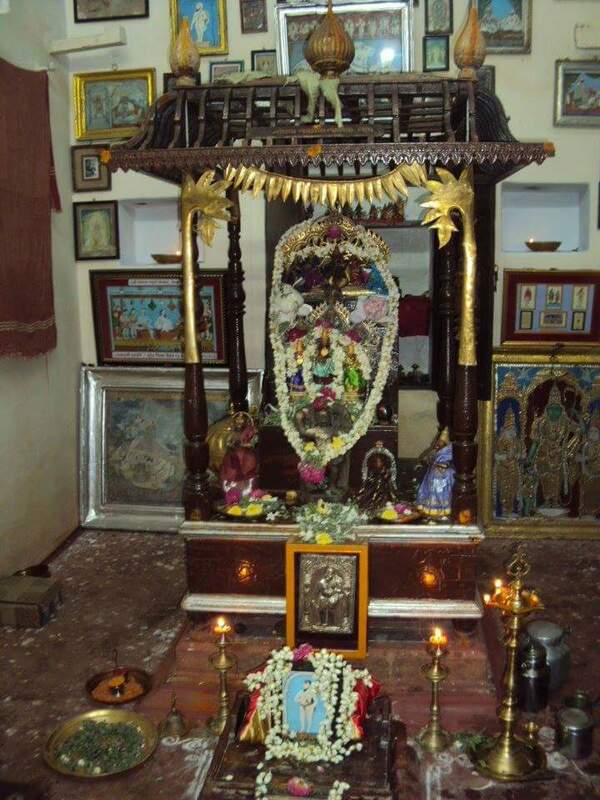 A temple was built in Sajjanagad and the idols were installed there, and are still being worshipped, proclaiming Thanjavur’s association with the great Maharashtrian saint. 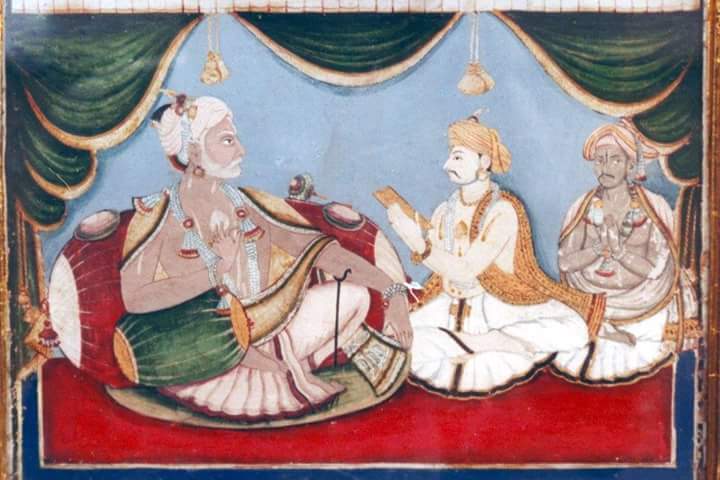 A puranic story says during the rule of King Pratap Singh (1740-1763 A.D), he met Bheemaswami to see the Ram dharshan. 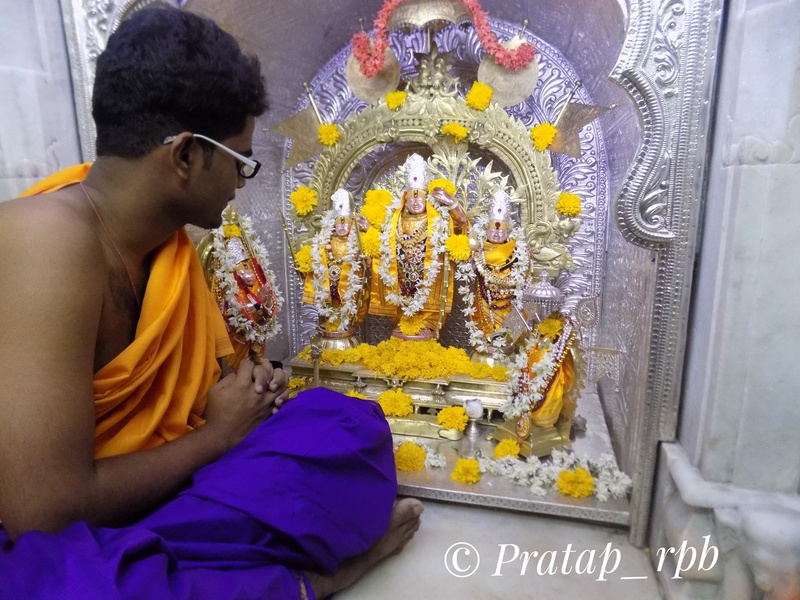 During the time of Ramnavami utsava, Bheemaswami during the Harikatha, he prayed to lord rama “Dhavare Ramaraya” singing a song. During that time the idol of Lord Ram moved automatically two feet forward from the mandap, giving a bright light. That incident made King Pratap singh to know the power of Sampardhaya. 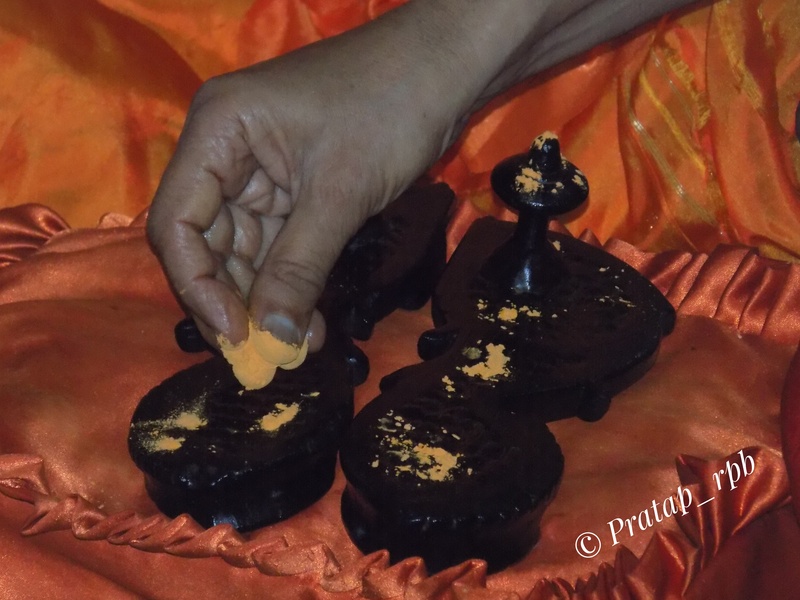 He became the devotee and took diksha (mantro padesha). 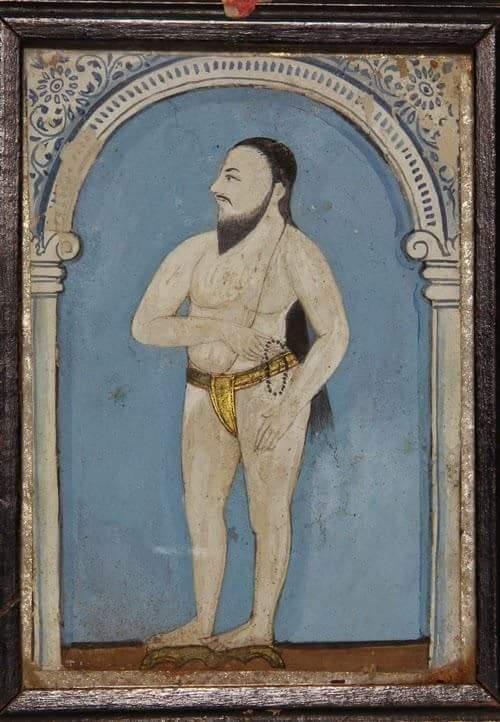 Sethuswami’s mutt who was the disciple of Anantha mouni of Mannargudi-one of the disciple of Samartha Ramdas, was established by King Pratap singh in his Thanjavur court. 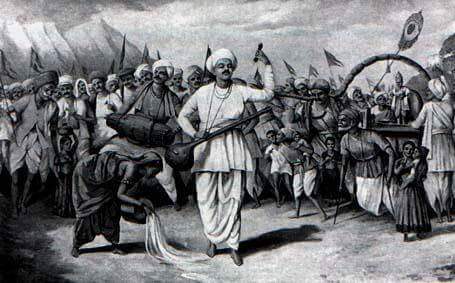 King Pratap singh took Mantro Upadhesa. 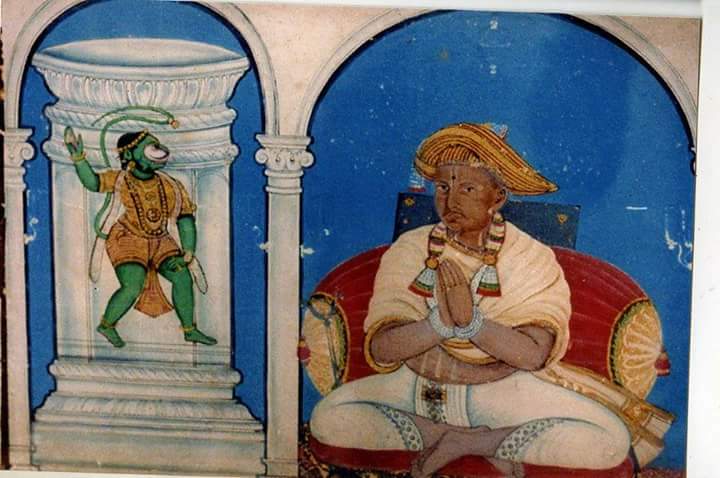 Pratap singh maharajah contributed to his guru Sethu Swamy, two temples of lord Ram and Hanuman in the name of Prataparama,in Thanjavur west main street. Now it is named as Vijayarama mandir another temple named as Pratap Veera Hanuman (mulaiahanumar kovil). Some of the photographs from Thanjavur Sri Bheemaswamy Mutt (Big Mutt). Bheemraj Goswami’s disciples went on to establish mutts too. Each of the disciples had a particular object that had been used by Bhimraj Swami. 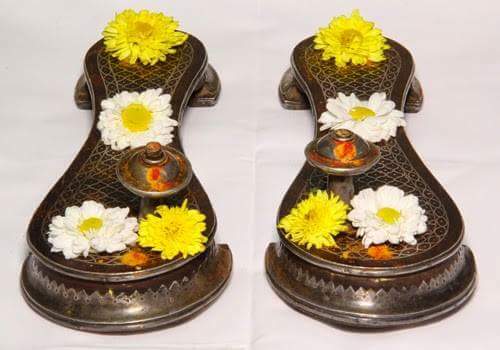 Thus the Govindabalaswami mutt in Sakhanaicken Street was established by the disciple who had Bheemraj Swami’s Paduka. The Annaji Bhava mutt in Tanjore South main Street was established by the one who received the kubuddi (stick) and the Joliram mutt was established by the one who received the Joli (biksha bag) of Bheemraj Swami. 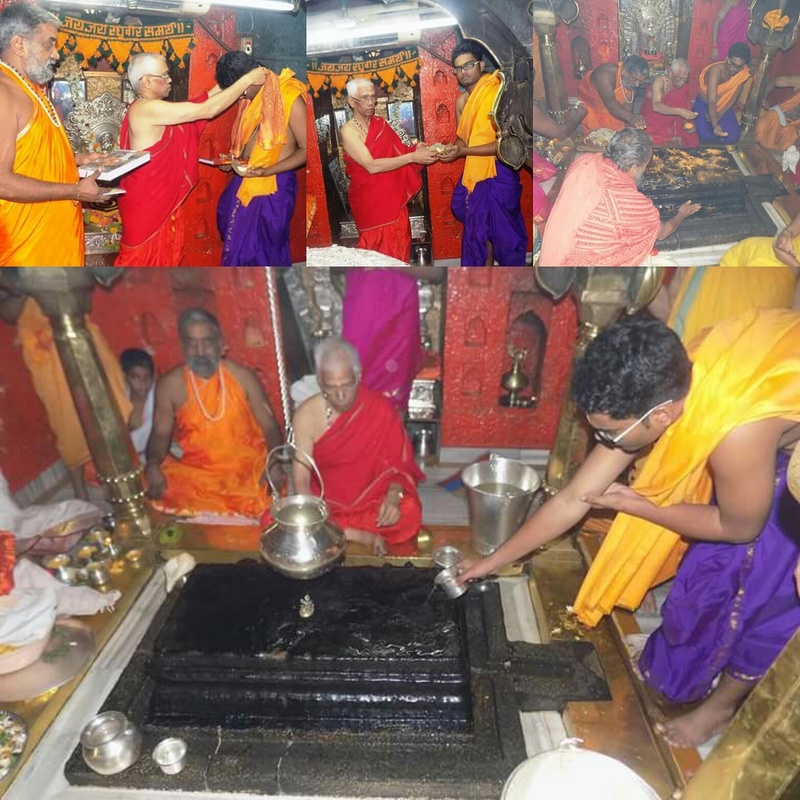 There is a Bheemaswami mutt in South main Street, the founder of which was in charge of maintaining the samadhi of Bheemraj Swami in Karuntattangudi. 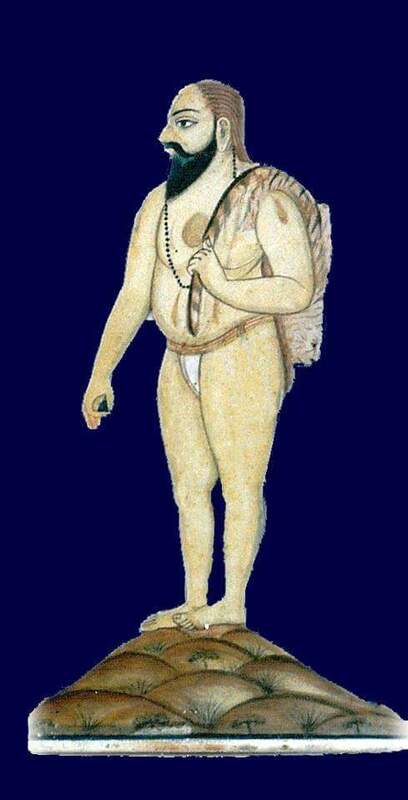 Portrait of Samartha Ramdas made by his disciple Bheemaswami Shahapurkar. 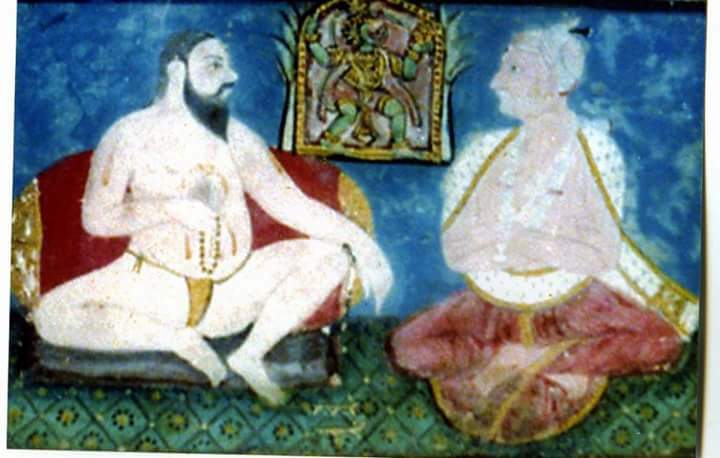 Many of the manuscripts are in Modi, and contain abhangs and other compositions. There is also correspondence in Modi, written from Sajjanagad to Thanjavur, from 1860 onwards. The postal covers, with the stamps are intact too. 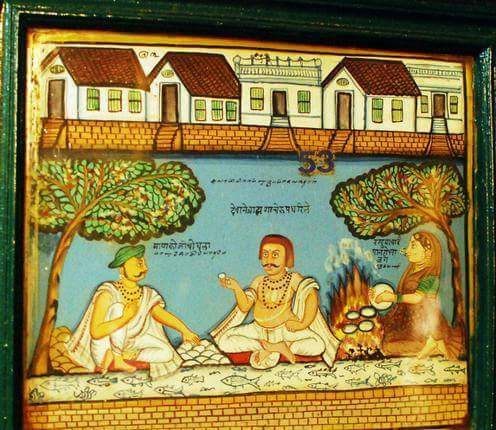 The Joliram math has some very old, beautiful paintings of the lives of the Maratha saints. The math in Mannargudi, and the one in Sakhanaicken Street too continue despite odds. But the Konur mutt vanished long ago. 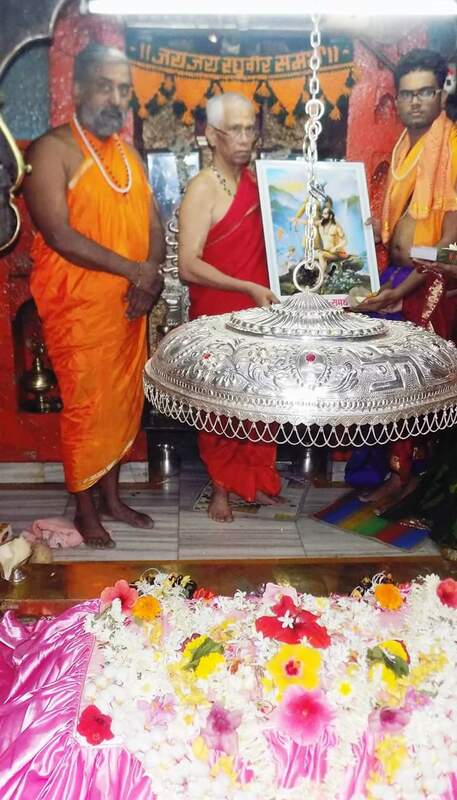 Sri Samartha Ramdas shishya- Sri Bheemaswami Sahapurkar with Shishya Ramanatha Swamy and Shishya Seenappa Swamy. 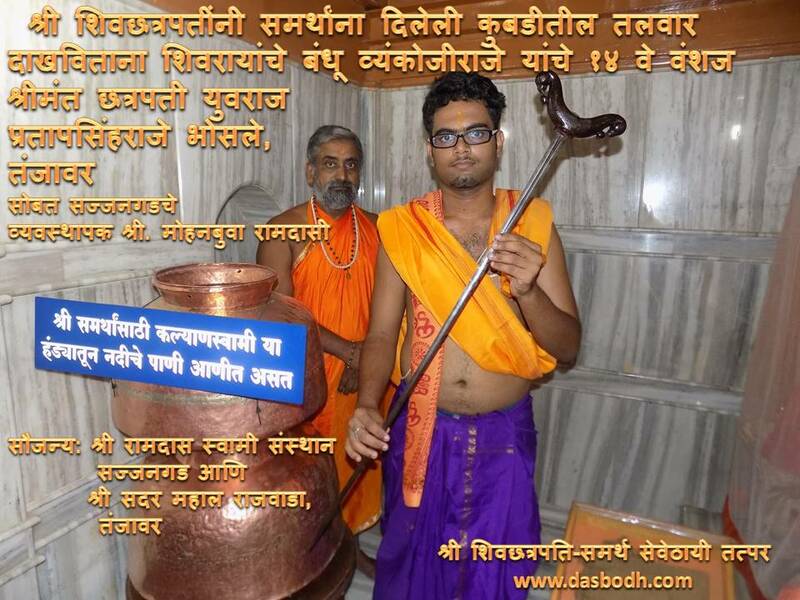 Dasabodam (Dasbodh) A philosophical work by Samartha Ramdas Swami written in OVI metre in marathi.This was translated into Tamil and delivered as a lecture by Madhoba Ratnakarar head of a mutt. Gopaladasam copied these Tamil lectures during the narration, as revealed in the colophon of the manuscript. Samartha is of opinion that only those who conduct the house hold life successfully are competent to be a Mumukshu (seekers of divine knowledge). This has been published by TMSSML and edited in two parts. Satara Bhonsle Royal family are still the patrons of Sajjangad. 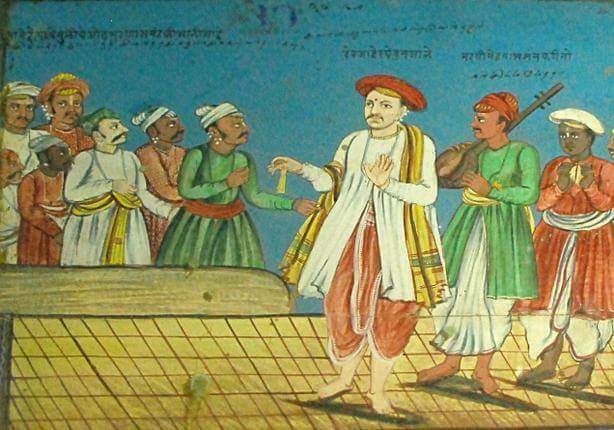 In the Photo, Shree Shivaji Raje Bhosle of Adalat Rajwada, Satara-uncle of Chatrapathi Udayan Maharaj at Sajjangad fort. 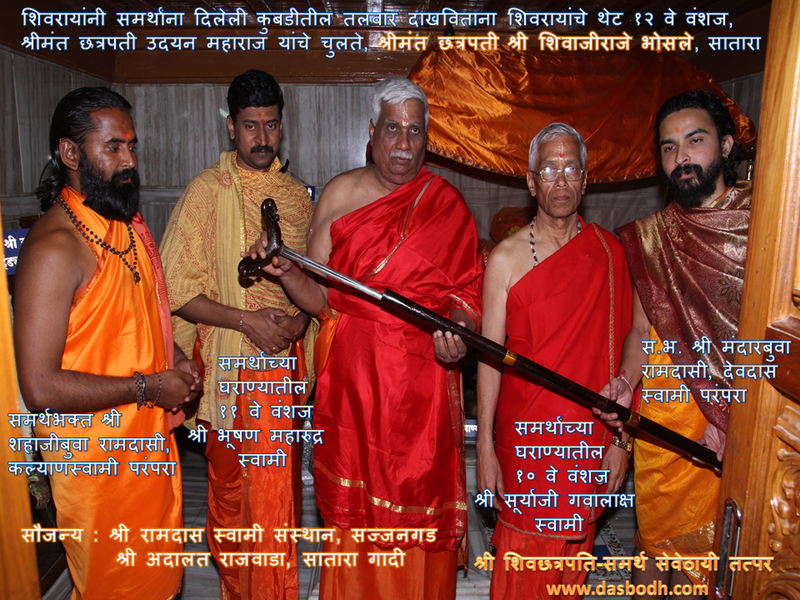 Here in this photo, 14th descendent of King Venkoji alias Ekoji of Thanjavur Sadar Mahal Palace at Sajjangad fort posing with a sword given by Chatrapathi Shivaji Maharaj to Swami Samartha Ramdas. 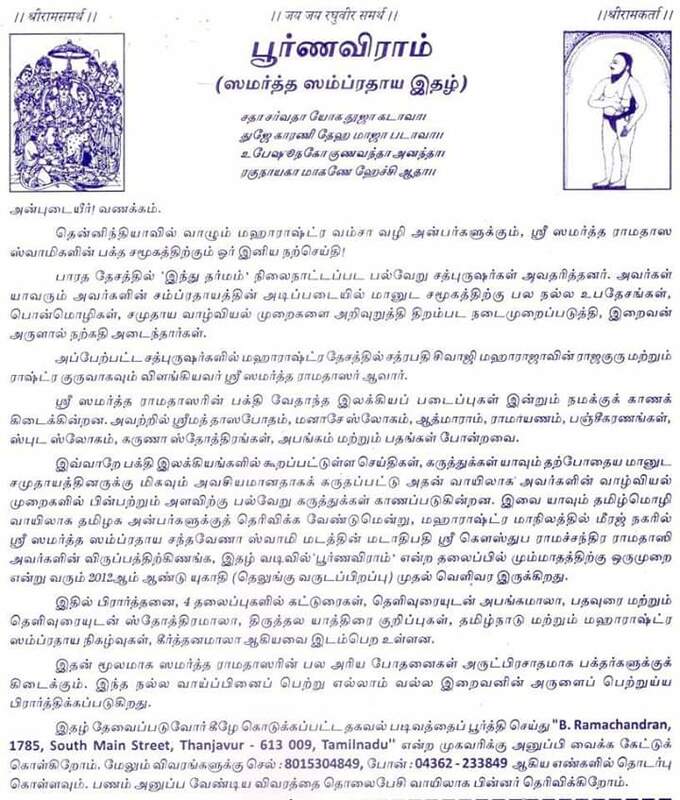 Thanks to Sri Ramachandran B. Keskar,descendent of Sri Bheemraj Goswami and incharge of Thanjavur Bheemraj Goswami Mutt for helping out with the text. Photo Courtesy: Sri Bheemraj Goswami Mutt,Thanjavur.